Book now Watch Video What Are Escape Games? 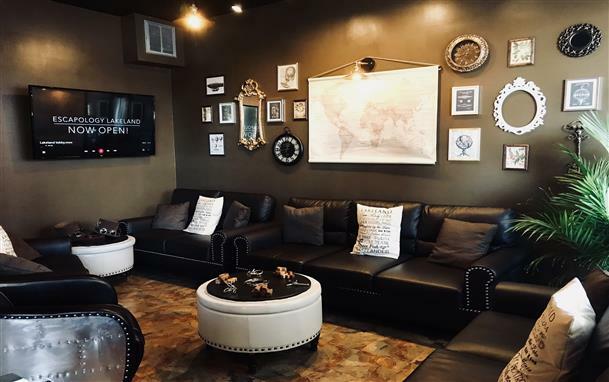 Premier Escape Room located in beautiful Downtown Lakeland next to Gent's Classic Cuts! Work together as a team to search the room for clues, solve puzzles and riddles, and decode locks to ESCAPE within 60 minutes! All of our Escape Games are private and will accommodate 2-8 guests. Walk-ins are welcome, but reservations are encouraged if you want a particular time and escape room for your group. Book online, by phone, or by email. Great activity for family, friends, date nights, co-workers, corporate team building & more! Do you have what it takes to Escape? Time is of the Essence! Book a Private Escape Game Today! Escapology is the world’s fastest growing escape-the-room franchise. It is a high adrenaline escape game where players are locked inside a themed room and must complete their mission before time runs out. During the 60-minute experience players are immersed into a real-life adventure where they must find hidden clues, crack codes, solve challenging puzzles and escape! How long will the experience last? The game itself is 60 minutes although you might escape earlier! You need to arrive at least 15 minutes before your start time and after your game you will be given a game debrief and we will take your team photo. Allow 90 minutes for your end-to-end experience. What skills do I need to play? No special skills or knowledge are required to play the games, apart from a decent understanding of English. May I leave the room in the middle of the game? It is better for your experience to stay in the game until you escape, although in an emergency you can always leave the game. What if we need help during the game? You’ll be monitored closely via secret surveillance linked directly to your dedicated Game Master in our Control Room. If you are stuck you may ask them for a hint! May I book a large group or a private event? Yes you can! You'll need to contact the venue individually and they will be able to advise on what is best for your group. How do I book a game? Just choose your location and click the BOOK NOW button. You can either go directly to the booking page or check out the games first. All games have a BOOK NOW button clearly displayed. Where do I park when I arrive for my booking? Can we book a room with more than 8 guests? Yes. Please call ahead for room availability and capacity. As a courtesy to all players, all games start exactly at their published time. If you arrive late you can still play but you will have time deducted from your 60 minutes. You must arrive at least 15 minutes before your game start time in order to check in and sign your waivers. There will be no refunds for late arrivals. No! Mobile phones are not allowed to be used in the room. The use of electronic devices or any outside tools are strictly prohibited. We provide a safe place in each game room for you to store your phone and belongings while you play! What do we do if we don't want to be booked with other people? No need to do anything. All of our Escape Rooms are private. Which means that whether you book with 2 guests or up to 8 guests, you will have the room exclusively for your booking. We regret that tickets cannot be exchanged or refunded after purchase. We may be able to change your game to an alternative slot or provide credit for a future game. Please call the venue for more details. Am I really locked in a room? No. Fire marshals would never allow that. You will definitely “feel” like you are locked in but if you ever need to step out of the room, then you can. You will be so immersed in the game that you won’t even think about it! Are your games wheelchair accessible? Yes. We pride ourselves on having totally accessible games. There maybe occasional puzzles that require additional assistance but in general everyone can play an active part in all aspects of the games. Many are, although we definitely advise getting in touch with your venue to find out exactly what facilities they have. Just come as you are! Just make sure you are comfortable as all of your senses will be on high alert!